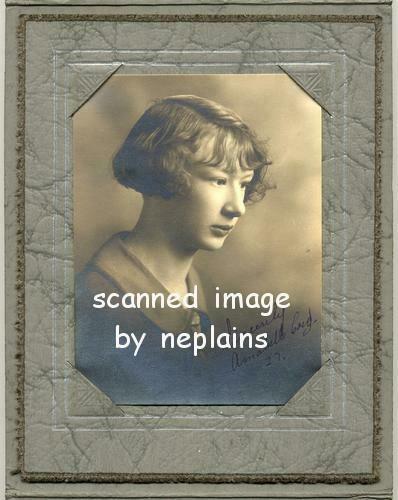 Item is a studio protrait of a young woman. Handwritten at the lower right is, "Sincerely, Annabelle Card, 27". Presumably this is a high school graduation photo. The photographer was Anderson Studio, Lincoln, Nebraska. This photo measures approximately 2-3/4 x 3-3/4 inches, and it is inserted into a tri-fold mount that measures 4-1/2 x 5-5/8 inches when closed. The attached "frame" has a deckled edge and silver accent. The photo has great detail and is in excellent condition. The mount has only minor wear and a few small scuffs.